MADISON, Wisc. — It took overtime, but No. 2 Ohio State held off No. 8 Wisconsin 30-23 on Saturday night. OSU scored first in O.T. on a 7-yard touchdown pass from J.T. Barrett to Noah Brown, then the defense held when Wisconsin had four chances from the 4-yard line to tie the game again. The Buckeyes stopped Wisconsin’s top running back, Corey Clement, twice for no gain, forced quarterback Alex Hornibrook into an incompletion, then ended it on a sack credited to Tyquan Lewis. Ohio State seemed to have turned the game in its direction in regulation when it scored two touchdowns to erase a 16-6 deficit to go up 20-16 with 14:09 left in the game. But Wisconsin, which had been held to 11 yards total offense in the third quarter after rolling up 313 yards in the first half, responded with an 11-play, 81-yard drive to go ahead 23-20 with 6:11 left in the game. Austin Ramesh got the go-ahead touchdown on a four-yard run, but a 36-yard pass from Hornibrook to Jazz Peavy and a 20-yard run by Clement were the big gainers in the drive. The Buckeyes had cut the Badgers’ lead to 16-13 when they took advantage of good field position, starting at Wisconsin’s 47-yard line late in the third quarter. A one-yard run by Barrett ended the drive. Then, after a pass interception by Gareon Conley at Wisconsin’s 38-yard line, OSU took advantage of a short field again. Four plays after Conley’s pick, Barrett scored again, this time on a 9-yard run for a 20-16 lead in the first minute of the fourth quarter. Ohio State answered Wisconsin’s go-ahead drive with a 61-yard drive of its own that ended with a 31-yard field goal by Tyler Durbin that tied the game 23-23 with 3:57 to play. “We did not play well, except in certain areas. But, man, did they play hard,” Ohio State coach Urban Meyer said. Clement led Wisconsin with 164 yards on 25 carries and Hornibrook was 16 of 28 for 214 yards and a touchdown. Barrett was 17 of 29 for 226 yards and a touchdown and rushed 21 times for 92 yards and two TDs. Even though Barrett’s statistics were not dazzling, Meyer liked what he saw from his junior quarterback. “I know who I want behind center in that kind of environment — J.T. Barrett,” he said. “He didn’t play his best but the absolute test of a leader is to raise the level of play of the people around him. “That was a tough one. They did some good things against us. They had two weeks to prepare for us and it showed,” Meyer said. Outside of forcing Wisconsin to settle for field goals instead of touchdowns twice and its own kicking game, Ohio State did not have much to feel good about in the first half. Wisconsin put Ohio State in a 10-0 hole in the first nine minutes of the game and the Buckeyes spent the rest of the first half trying to catch up. OSU allowed 313 yards total offense in the first two quarters to the Badgers. Clement, who hadn’t had a 100-yard rushing game since the second week of the season, crossed the 100-yard mark with 8:43 left in the second quarter. And wide receiver Peavy, who carried the ball four times in Wisconsin’s first five games, tore through OSU’s defense for 67 yards on five carries. The Badgers took a 3-0 lead on a 46-yard field goal by Andrew Endicott on its first possession. They went up 10-0 with 6:17 left in the first quarter when Hornibrook threw a 24-yard touchdown pass to Peavy. Ohio State drove from its own 25-yard line to Wisconsin’s 4-yard line the next time it had the ball before the drive stalled and it had to settle for a 25-yard field goal by Tyler Durbin. A career-long field goal of 40 yards by Durbin early in the second quarter cut the lead to 10-6, but that kick, like the one before it, came when another OSU drive was stopped inside Wisconsin’s 25-yard line. The passing game problems that Ohio State had when it got only 91 yards in the air in a 38-17 win over Indiana last week carried over into another week in the first half. Barrett was 2 of 6 for 21 yards before hitting 3 of his final 6 attempts for a toal of 82 yards. Wisconsin got two more field goals from Endicott in the final 2:47 of the first half to take a 16-6 lead to the locker room at halftime. The first was from 32 yards and the other came from 22 yards. Ohio State running back Mike Weber (25) gets past Wisconsin’s Zach Baun during Saturday night’s game in Madison, Wisc. http://aimmedianetwork.com/wp-content/uploads/sites/38/2016/10/web1_10.16.16.osumain.jpgOhio State running back Mike Weber (25) gets past Wisconsin’s Zach Baun during Saturday night’s game in Madison, Wisc. Ohio State quarterback J.T. Barrett (16) scrambles against Wisconsin’s D’Cota Dixon during Saturday night’s game in Madison, Wisc. http://aimmedianetwork.com/wp-content/uploads/sites/38/2016/10/web1_10.16.16.osusecondary.jpgOhio State quarterback J.T. 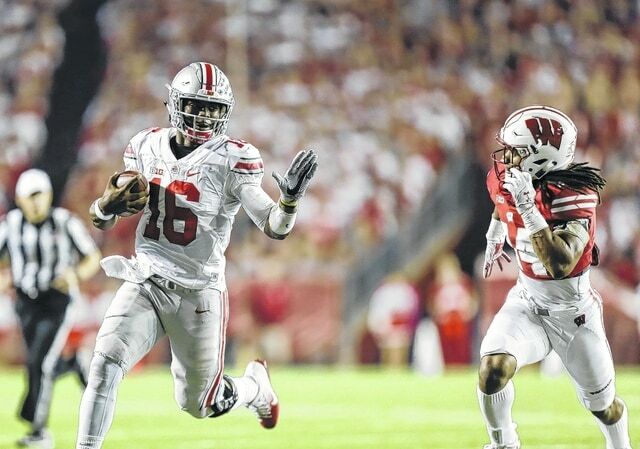 Barrett (16) scrambles against Wisconsin’s D’Cota Dixon during Saturday night’s game in Madison, Wisc.